There’s no mention as to when this deal ends, so if this is an item you’ve been looking to purchase, now’s the time to do it while it’s less (note – I’ve seen the 2GB version page show different prices throughout the day, sometimes it says it’s only $849.99 – it changed twice as I was writing this). I have a MacBook Air and I love it! I use it when I travel, since it’s fast, looks great (for such a small screen), and the small, thin design makes it fit easily in my pocketbook without adding much weight (just over 2 lbs!). 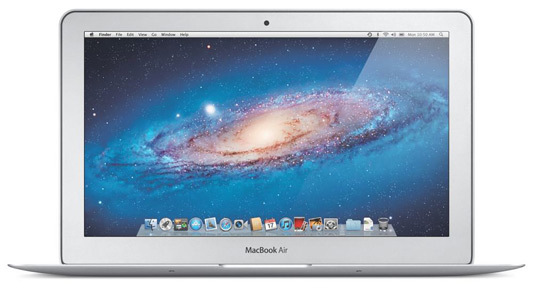 This version of the MacBook Air (model MC968LL/A) sports a 11.6-inch high-resolution display, 1.6 GHz Intel Core i5 dual-core processor, 64 GB of flash memory storage, 2 GB of RAM, and an Intel HD Graphics 3000 integrated graphics processor (see full specifications below). It also comes with the iLife software suite, which includes the latest versions of iPhoto, iMovie, and GarageBand.